Bob Dylan’s impact on popular music and culture is immeasurable. The recipient of the Presidential Medal of Freedom and the 2016 Nobel Prize in Literature, he is responsible for some of the most influential albums of all time, such as ‘The Freewheelin’ Bob Dylan’, ‘Highway 61 Revisited’, and ‘Blonde on Blonde’. He continues to be vibrant and on the cutting edge, Bob Dylan has received 10 GRAMMY Awards (including wins for Love And Theft, Modern Times and the Album of the Year GRAMMY for Time Out of Mind), as well as the Academy Award for Best Original Song for ‘Things Have Changed’ in 2002. Neil Young remains the only artist of the rock era to compare to Dylan. Classic albums like ‘Harvest’, ‘After The Goldrush’ and ‘On The Beach’ are some the best in the whole genre. But Young remains hugely relevant and prolific, releasing 2 albums within months of each other in 2017/2018, as well as a stream of archive albums from classic live shows over the years, underlining his incredible live legacy. This time, he brings Promise of the Real, with whom he recorded 2017’s album ‘The Visitor’, their second studio album together and this year released the soundtrack album ‘Paradox’. The band features Willie Nelson’s sons Lukas and Micah. They also star in Bradley Cooper and Lady Ga Ga acclaimed new movie ‘A Star Is Born’, with Lukas as musical consultant. Provisional Times - Gates Open: 14:00H – please note the gates will be open approx. 60 minutes early for those customers who have Diamond View and VIP Garden tickets * The Ultimate Bar * Opens @ 13:00H or arrive at your leisure. Age restrictions - Anyone under 16 must be accompanied by a parent or guardian (18 or over) - Disabled Access - All tickets are available via the festival website or AXS.com. There is a Wheelchair platform and an Ambulant area. All tickets come with 1 free personal assistant. 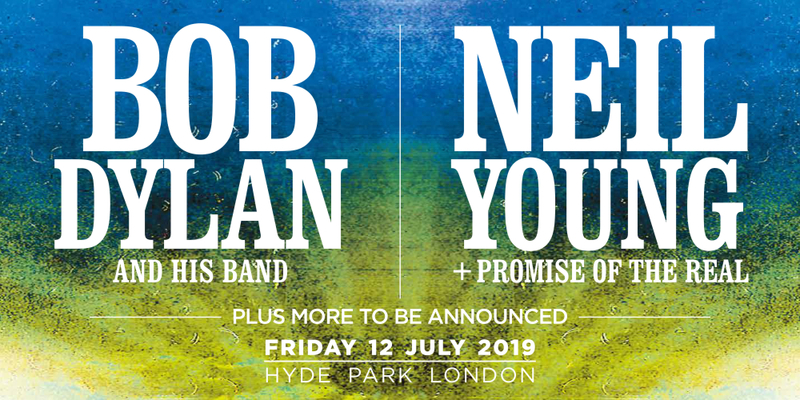 We regret that special access tickets are only bookable via the AXS Hyde Park website.